“We wanted to return creatively as storytellers to a medium we love with comics, Colin is a New York native, and Chris Moreno ‘Makes It Happen’”, says Cruz, in a nod to the artist’s website slogan, and adds that the intention is to “explore the perils we face when we decide to live out our dreams”. 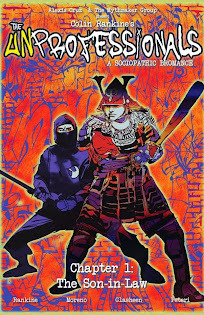 Says Moreno: “Coming up in an industry like comics that has no set playbook, I can relate to the main characters in, The UNprofessionals, without the whole ninja assassin thing of course. But Colin and Alexis have created the perfect environment to live out my hitman-for-hire fantasies." Cruz, who just wrapped the paranormal thriller, Sighting, in which he stars, intends to expand the property beyond the realm of graphic novels, by developing a film and possibly a video game. The plan is to create the multi-platform property in stages, with separate but complimentary story lines and self-publish a Limited Edition offering by Alexis’ company, 929 Entertainment and their imprint, The Mythmaker Group. The Mythmaker Group is an intellectual property development company; a professional cooperative of writers, directors, animators, visual and performing artists, and other creative forces that draws and cultivates talent from many disciplines throughout the entertainment industry in order to develop the best, most innovative expressions for original content; specializing in trans-media story design ranging from film and television, to interactive web content and ARGs, to graphic novels. The Kickstarter campaign for “The UNprofessionals” can be found at http://www.kickstarter.com/projects/alexiscruz/the-unprofessionals-a-graphic-novel-of-sociopathic and runs November 1st through November 31st. More information about this and other Mythmaker Group projects can be found at www.themythmakergroup.com. The Mythmaker Group™ & "The Unprofessionals - A Sociopathic Bromance" © 2011 Colin Rankine & Alexis Cruz, 929 Entertainment. All Rights Reserved.